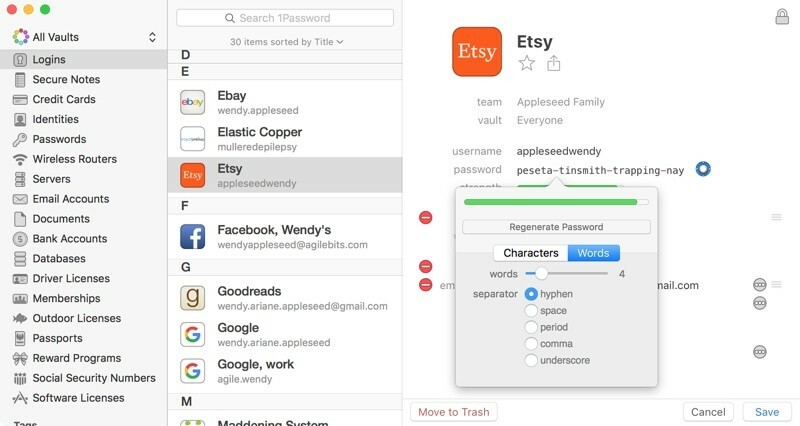 AgileBits today announced a new Mac version of 1Password, its popular cross-platform password management app. 1Password version 6.0 for Mac includes several new features like an All Vaults view, a new password generator, and iCloud sync for all versions of the Mac app. 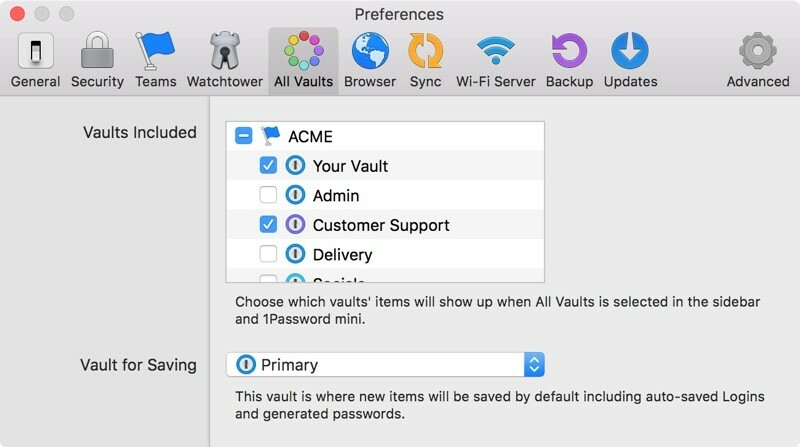 1Password's new "All Vaults" view allows users to see all of their passwords and password vaults at a glance, both in the main 1Password app and the menu bar view. Many people use vaults to organize and share their passwords for different purposes, so this will be a handy feature for accessing the passwords from multiple vaults without needing to switch back and forth. All Vaults also incorporates information from the Teams Beta, and there's a new Teams-only mode. Along with a new vault view, the new 1Password update introduces a revamped Strong Password Generator that brings it inline with the 1Password for iOS app. Included is a new wordlist password generator with a "Words" option to create a password that is composed of random words. Wordlist passwords are useful because they're much easier to remember than a random assortment of characters, but are no less secure. For people who use the non-Mac App Store version of 1Password, there's an important new feature - iCloud syncing. Apple previously did not allow non-Mac App Store apps to sync with iCloud, but changes to CloudKit have now allowed AgileBits to implement iCloud syncing for the version of 1Password purchased directly from the AgileBits Store. Being able to sync a non-Mac App Store app with iCloud is an achievement that took quite a bit of work to implement, and it's something that other non-Mac App Store Apps don't yet feature. As AgileBits explains, the feature in 1Password is built using CloudKit web services. In addition to these new features, the 1Password for Mac update includes a long list of bug fixes and feature improvements, which can be found in AgileBits' full change log. Customers who own the non-Mac App Store version of 1Password can update to 1Password 6 immediately. AgileBits is waiting for the Mac App Store version to be approved, at which point those customers will also be able to upgrade at no cost. I would love to be able to only use iCloud Keychain, but there are a several reasons why I have 1Password. * There are websites that won't allow iCould Keychain to populate their fields. 1Password gets around this. * If a website is set up with a two page login you can configure 1Password to work with it, whereby iCloud Keychain generally won't. * If I am using an app on my iPhone, and all else fails it's really easy to get to 1Password to copy and paste my passwords. * With iCloud Keychain the suggestion is what it is, and you cannot edit it. With 1Password I can edit the suggested password before sending it to the web form. This is very helpful if the website in question insists on you using a special character. * 1Password allows you to use the same vaults on Windows as OS X and iOS, as long as you use Dropbox to synch. I don't use this functionality, because I don't want my passwords stored in Dropbox. But if you're stuck on Windows at work you can use it to still get to your password vault. Hands down the best app on ios/osx. I use it all the time. It's great to have all that info in one place, easily accessible from all my devices. Outside multiple vaults/team users, 6 seems to be a minor update. Not exactly complaining since it's a free update though. In your use case probably not many. I can't think of much else in your scope off-hand. Perhaps someone else can add. Isn't the 50$ price for a single license? If it can be shared amongst family members, then it might be worth it. And to your point of you getting 4 year updates, I highly doubt that. This update to v6 was free but I think this is an anomaly? Usually, you pay an upgrade fee. Through the Mac App Store, Family Sharing is enabled so yes, one license works for everyone in the household. I bought 1Password about 2 years ago (v4) I don't recall paying For the v5 update, and this v6 update is free too, so I'm going to get at least three years. Four years might be a stretch but these free updates are not so much an anomaly as a sympton of developers struggling with Apple's policies on upgrade pricing. I don't particular like taking advantage, but thats the way it is and I dont see Apple relenting any time soon. But it's not "whatever we call it" because there is an important difference: LastPass was truly hacked (if memory serves) by people who broke security that was the responsibility of the company; iCloud was "hacked" by people who broke security that was the responsibility of the individual users (to put it another way, you've never heard of an iCloud "hack" involving people with good, difficult-to-guess passwords). Any LastPass vaults that are stolen can then be brute forced at the hacker's leisure. Thus, the difference between iCloud's "hack" and that of LastPass becomes important. I don't trust, and don't recommend anyone else does, either, a security company that can't even keep their own network locked down.